The Framework of Support is the central philosophy guiding our activities. This philosophy holds that the person experiencing mental illness is at the centre of any supportive mental health system. The goal of the Framework is to ensure that people experiencing mental illnesses live fulfilling lives in the community. CMHA Kootenays has been accredited through CARF (Commission on Accreditation of Rehabilitation Facilities). 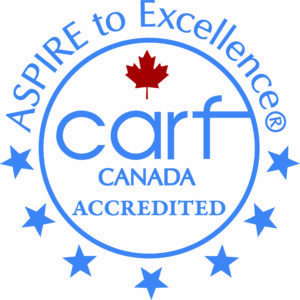 CARF accreditation is assurance that our programs and services are of highest quality and that we have demonstrated a superior performance for those we serve. For more information on CARF click here.